A total new-build capital expenditure (capex) of US$846bn is expected to be spent globally on planned and announced upstream projects from 2019 to 2025. Royal Dutch Shell Plc leads among all oil and gas companies and is expected to spend US$54.6bn on upcoming upstream projects during the forecast period, according to GlobalData, a leading data and analytics company. The company’s report: ‘H1 2019 Global Oil and Gas Upstream Capital Expenditure Outlook by Key Countries and Companies to 2025 – Shell Leads New-Build Upstream Capex Outlook among Companies’ reveals that Gazprom and Exxon Mobil Corp are the next top spenders with new-build capex of US$49.8 billion and US$43 billion, respectively. 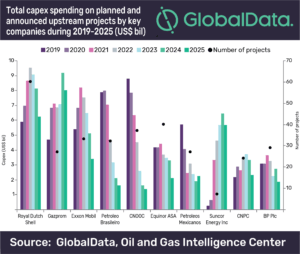 GlobalData identifies Canada, Russia, and the US as the top countries in terms of new-build capex to be spent on planned and announced upstream projects during the outlook period. Canada tops the list with capex of around US$107.7bn. Russia and the US together will spend around US$143.8bn on planned and announced upstream projects, from 2019 to 2025. Globally among the planned and announced upstream projects, Golfinho-Atum Complex in Mozambique has the highest capex spending of US$16.8bn between 2019 and 2025. Voyageur South (Suncor Energy Inc.) project in Canada, and Mamba Complex project in Mozambique follow with an estimated capex spending of US$15.8bn and US$14.8bn, respectively during the outlook period.